The new Audi Q5 is full of performance features that help make it a popular luxury compact SUV. These are a few of those features for you to consider. The Quattro all-wheel drive in the new Audi Q5 is getting a lot of attention this year because it helps keep your car safer in inclement weather. Regardless if the roads are wet or covered in snow, the Audi Q5 will get you safely where you need to be going. 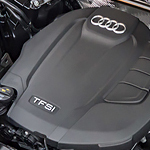 Another impressive performance feature in the Audi Q5, the dual-clutch seven-speed S-Tronic transmission. When you count on fast shifting performance to get you out of trouble or around other slower vehicles, the new Audi Q5 has what it takes to make short work of those situations and give you all the power you'll need. The new Audi Q5 is now available for a test drive when you visit us at Audi Memphis.